Mommy Spicers! I had so many of you wanting a new breakfast idea that I decided to try something a little out of my wheel house. 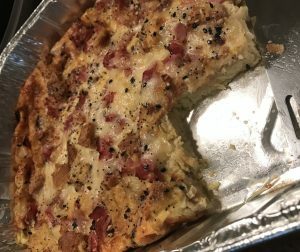 Breakfast casserole! We usually go the breakfast sandwich route but boy was this easier. A literal dump and bake breakfast, it’s so easy! You can prep this the night before and then just pop it into the oven in the morning. Preheat your oven to 350 degrees. Dice into bite size pieces, your bread, ham and cheese. Then place them into a well greased glass baking dish. Mix together your eggs, milk, salt and mustard. Pour egg mixture evenly over bread and ham mixture. Bake uncovered 45-50 minutes. 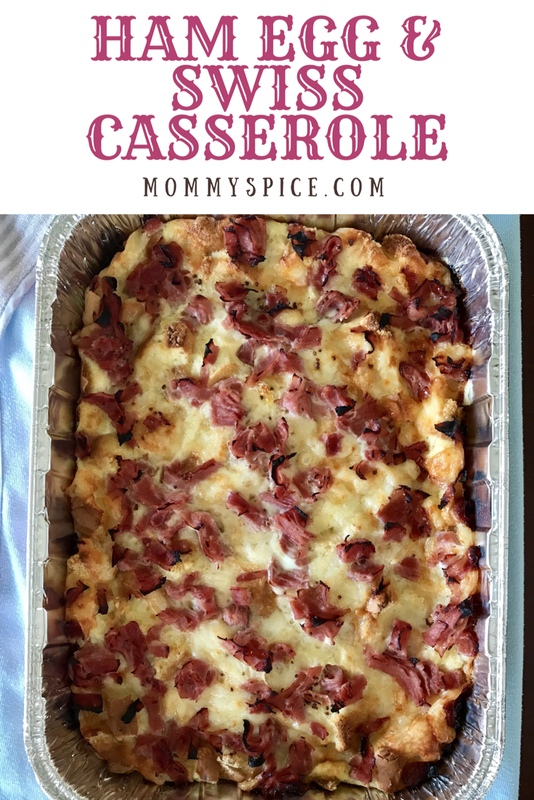 I doubled this recipe and made 2 casseroles, one went to my kids teachers for their back to school breakfast and the other we kept for ourselves. I prepped them the night before and all I had to do was wake up and bake them. 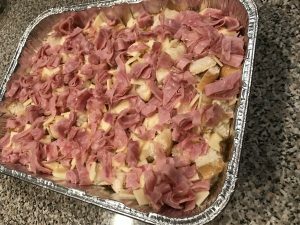 If you desire a creamier casserole you could cover while baking it, we preferred the nice charred edges the ham gets when baked without a cover. It’ll give you an ever so slight smokey flavor without any real smoke being needed. The mustard is a really faint after-note flavor, so if you don’t care for mustard, no need to shy away as it won’t overpower the dish. 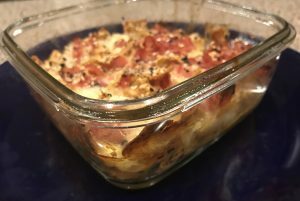 My tip for this one, if you’re making this breakfast casserole to take somewhere, use those foil to go dishes. You can prep, bake and deliver your casserole all in the same dish. No worry to get your dishes back, and an easy clean up for your lucky guest after their delicious breakfast. 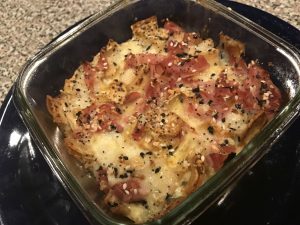 This casserole can so easily be vegetarian by leaving out the ham, I also made a smaller Keto portion that turned out great. I used 2 small flax pitas, cut into 1″ pieces in place of bread. After making this dish a few times now, I am really a fan of the Everything But The Bagel Seasoning on top. 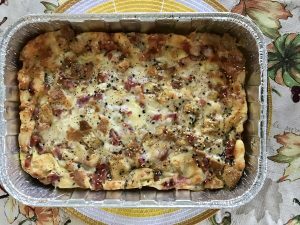 It has all the flavors of bagel breakfast sandwich deconstructed into a really yummy casserole. 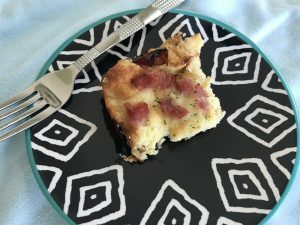 Be sure to put this on the menu for your next brunch, or if you’re an early riser with 45 minutes to spare this could be a nice warm breakfast on a weekday morning before school and work. I’m planning to make this again soon, so that I can slice and freeze individual portions. Check back soon to see how they freeze and reheat, could be a real game changer for weekday protein packed breakfast. Here is a picture of the smaller Keto version I made using a 4×4 dish.